2015 NBA most valuable player Stephen Curry is in danger of losing the ability to play in the next game for the Western Conference Finals. 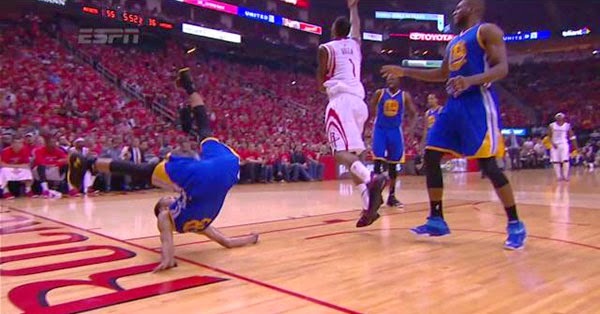 The 27-year-old Golden State Warriors point guard suffered a head contusion following a nasty fall in Game 4 which happened after Trevor Ariza of the Houston Rockets received a pass underneath the basket in a fastbreak play and head faked. Curry jumped high and tried to block the attempt resulting to him landing hard on his back and hitting his head on the floor. He appeared stunned as he was being attended to before he slowly got up and walked off the court. The fall seemed to be a rallying point for the Golden State Warriors as they cut the lead down to 7 points after the fall. The Warriors were only down 10 at halftime. The Rockets were up by 25 at one point. The drama continues in the 2015 NBA playoffs wherein only four teams are left trying to get the right to represent their respective conferences. In the Eastern Conference, the Cleveland Cavaliers lead 3-0 against the Atlanta Hawks while the Golden State Warriors hold a same three game advantage over the Houston Rockets. The first team to attempt it is the Golden State Warriors playing on the road in Houston and the Cavaliers will take their turn tomorrow at 9 in the morning (Manila Time). Stephen Curry came back into the game before the five-minute mark remaining on the third quarter. He has not had an impact since returning, shooting an airball and getting his three-point shot attempt blocked. He was still visibly shaken from that nasty fall. Wow, I've never seen Curry get blocked on a 3 before. The Rockets avoided elimination in Game 4 and came out strong to start the game by draining threes in the first quarter eventually scoring 45 points, the most by any team in the first quarter for the 2015 season. They eventually won Game 4, 128-115.